I never wanted to learn how to make a carrot soup recipe. When I was young, I really could not bear the taste of cooked carrots back then. I could handle raw ones occasionally, but that is it. I remember when I was in school and had to eat lunch in the cafeteria. Back then there were no choices; you had to eat what was on your plate. I mean you HAD to eat what was on your plate! I would sit and gag over those carrots. When I became an adult, I taught myself to like carrots. 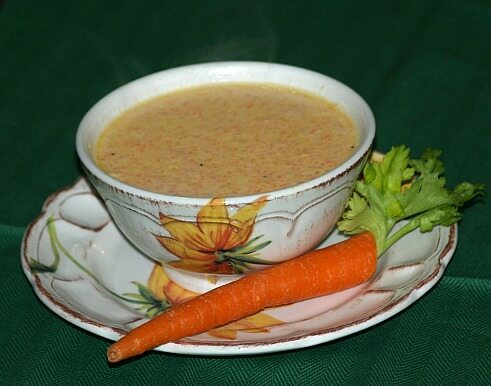 I started by learning how to make a carrot soup recipe whiich contained a variety of other vegetables also. I put a lot of effort in doing this because of the publicized health benefits in eating them. Besides of the fiber and antioxidants, many stories were told of how this vegetable would drastically help the eye sight; something which has been a problem in my family. Somehow I thought if I had a mouthful of mixed vegetables it would be easier to eat the carrots. After the soup I make stew with carrots making sure I ate some of the carrots. Eventually I became attached to this orange root vegetable; now I really love a plain creamy carrot soup recipe. I amazed myself now how I automatically throw carrots in most things that I prepare; both raw and cooked. It is so easy to add carrots to almost all soups that I make. Below I have several of my soup recipes; a few which contain mostly carrots and some which I add carrots to. All are very good! Melt butter in a heavy saucepan over medium heat. Sauté’ onions until tender. Stir in the flour, salt and pepper. Add carrots, and water. Stir to blend, cover and cook for 10 minutes or until carrots are tender. Put mixture in blender for a couple minutes to make smooth. Return to pan and slowly stir in the cream. Heat, but NOT to boiling point. Serve immediately. Combine chicken, water, onion, celery, carrot, bouillon and spices; bring to boil and simmer 30 minutes. Remove carrot and bay leaf (save); pour mixture into blender in portions and process until smooth. Place back into pot and add bay leaf back in pot; add milk and cream. Bring mixture to a slight boil; while mixture simmers chop carrot on small pieces for color (reserve). Blend flour with melted butter with enough milk to make a thin paste; stir in bouillon until smooth. Stir paste into soup stirring well; simmer 5 minutes or until soup is thick and creamy. Remove bay leaf and add chopped carrots; serve sprinkled with nutmeg. Learn how to make a carrot soup recipe containing potatoes, spinach and lots of seasoning. Combine all ingredients in large pot; bring to a boil. Reduce heat and simmer1 hour or until vegetables are tender. Remove bay leaf; pour soup in batches into blender and process until smooth. I always add carrots to my chicken noodle soup recipe and quite often I add chicken when I make a basic carrot soup recipe. Either one is quite delicious. Wash chicken; add water and salt. Boil 10 minutes; reduce heat and simmer 1 hour. Add onion, carrots and celery to chicken; simmer 1 hour longer. Remove chicken, remove bones and cut into pieces. Return chicken to broth; add noodles. Adding cheese to a carrot soup recipe or one with other vegetables added is a good way to cream the soup and add great flavor. Combine all ingredients except cheese in a large pot. Cook covered over medium heat until all vegetables are tender. Slowly stir in cubes of cheese stirring until all is melted; serve hot.